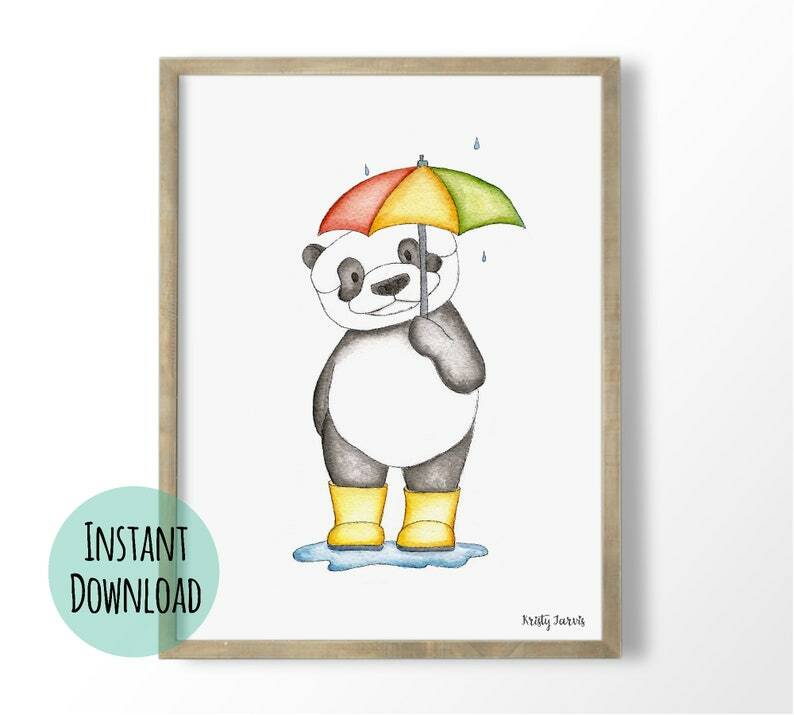 Hand painted watercolor panda art in rainbow colors. Art print for a gender neutral rainbow nursery. Great for a boy or girl nursery, colorful playroom, classroom or minimalist kid's room. Download after purchase, print, and frame. Watercolor animal hand-painted by me. DIGITAL FILE - YOU WILL NOT RECEIVE ANYTHING IN THE MAIL. PLEASE READ FULL DESCRIPTION BEFORE ORDERING! • After payment is received, you will be able download the files. • You can download them through Etsy and will also get an email with a link to the download page. • Download to your computer and print as many as you need (for personal use only)! All artwork in my design layouts is original. I do not use clip art. So if you ever see the same art in another shop, please let me know. All of my artwork is thoughtfully imagined, sketched, hand painted or digitally drawn by me. You can be assured that the whimsical art in my shop that you choose for yourself, child's room, or as a gift is lovingly handmade from start to finish. Please enjoy and print as many copies as needed for your personal project. All artwork in my design layouts is original and protected by copyright law. These files are for personal use only! Using any of these images in your own designs, reselling them as is, in any altered form, or displaying in anyway that results in collecting money is prohibited. Please be kind and respect the hours or love, sweat and tears that go into creating the original art that went into this design. All rights, license, copyright, and ownership of this artwork retained by artist. I accept direct check-out (debit/credit card), PayPal and Etsy gift cards. I offer replacements for prints lost in the mail or damaged upon arrival. Please send photos of damaged mail. Please contact me with questions. I want you to be completely happy with your purchase! If there is a problem with your order, please contact me via email with your order number at: kristyj.art@gmail.com so I can help! Q: Do you do pet portraits? A: At this time I don't do pet portraits. My specialty is made up whimsical characters which are primarily wild animals. Q: Do you do custom animals. A: I have found I am most creative creating animals in my own time. I love getting requests/suggestions for animals and when I feel inspired to create that animal, I can let you know when it is available. Q: Why is your shipping so expensive? A: My shipping fee covers the shipping cost plus a little extra for my time and supplies needed to carefully package your order. Q: Do you sell wholesale? Q: How should I frame your work? A: My work is designed to fit in standard 5X7 and 8X10 matted frames which are found at most decor stores. I leave the paper slightly larger than 5X7 and 8X10 to allow a slight overlap which makes framing easier. With this overlap, using matted frames is recommended so no trimming of the print is required. Q: Do you offer digital downloads? A: At this time, I only offer a few varieties of digital downloads and plan on adding more in the future.